It’s comeback time for Whistle Podu-ers Chennai Super Kings and Halla Bolers Rajasthan Royals. Plus, Gautam Gambhir might be up for auction. Is IPL 2018 going to be full of surprises? The crown prince of flat-track bullies, Rohit Sharma was a shoo-in to be retained by the Ambanis, given how he’s led Mumbai Indians to their record three trophies. Hardik Pandya’s reputation as a match-winner also helped his retention status, and this in no way had anything to do with his really dope haircut. Jasprit Bumrah was retained because opponents have become used to Malinga’s bowling action, while Bumrah’s is still too weird for them to figure out. It’s the Return of the Kings. Chennai Super Kings will be looking to demolish their opponents and recapture their dominant reputation as Whistle Podu-ers. Their retention choices are really no surprise since MS Dhoni is literally worshipped in the city. 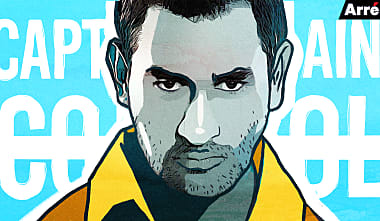 In fact, so revered is Dhoni by his CSK kin that they even took in his, ermmm, old running mates, Raina and Jadeja. Guess it pays to have a former Indian captain as your meal ticket, sorry, mentor. Remember Rajasthan Royals? No, not the Padmavati haters. The dominant team that won the inaugural IPL a decade ago? Well, neither do we. Owners Shilpa Shetty and Raj Kundra seem keen on reshaping this unit and have only picked up former Pune and current Australian Captain, Steve Smith. His only condition was to not have to say embarrassing catchphrases like “Halla Bol”. Nobody quite understands why the underachieving Delhi Daredevils do anything anymore. While they’ve retained some talented names, they don’t seem likely to retain their self-respect. With Iyer and Pant, DD are clearly banking on the exuberance of youth to take them through. Although, perhaps this move came a decade too late. It might have helped had they clinched Dailhi boy Virat Kohli a few years ago. Or maybe not. Going by his winless IPL record. Speaking of which.. Newly wed Captain Kohli has been the toast of Indian cricket and Sabyasachi enthusiasts the world over. Oh RCB! Always the bridesmaid, never the bride. Their newly wed Captain Kohli has been the toast of Indian cricket and Sabyasachi enthusiasts the world over. It helps that AB De Villiers and he have been known to wreak havoc on bowlers. So really, the only big surprise here is Sarfaraz being picked over the mighty Gayle. Though we expect them to do exactly what they do every year: Give us all a treat in the league stages with phenomenal batting and choke on their lacklustre bowling in the play-offs. King Khan’s Kolkata Knight Riders clearly favours some Caribbean flava over Captain Gambhir’s fiery disposition. We look forward to seeing both Narine and Russell being made to awkwardly dance to “Korbo Lorbo Jeetbo Re” behind King Khan at the IPL opening ceremony. Former IPL champions, Sunrisers Hyderabad have always had a solid team to back their chances at winning it all. Shikhar Dhawan’s absence is almost as shocking as SRH’s upset victory over RCB in the IPL 2016 Finals. Or this picture of Shikhar Dhawan without his moustache. Virender Sehwag, team director of Kings XI Punjab, is known to be a witty customer (and troller of young women) on Twitter. However, Kings XI Punjab’s recent form has been no laughing matter. Just like the recent Gujarat elections, KXIP’s play-offs hopes hinge around a Patel – Axar Patel. Also, Sehwag claims to like his sense of humour most among other hopefuls. You know what that says about him.